So let's start at the beginning - We kind of knew the joists in the dining room were going to be problematic - the floor was almost bouncy and the ceiling of the basement physically moved as people walked the floor of the dining room above. The floorboards however were in good condition, so it could really only mean the joists were the cause. 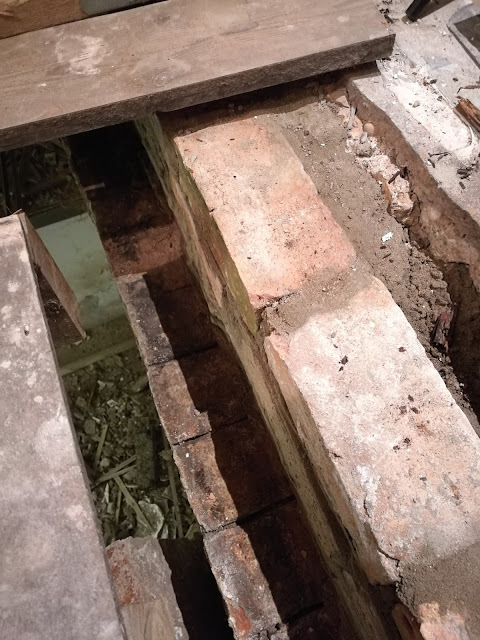 We investigated further and found the ends of the joists, which are in-bedded into the walls were crumbling away. Moisture from the walls and basement beneath had literally rotted the ends away. 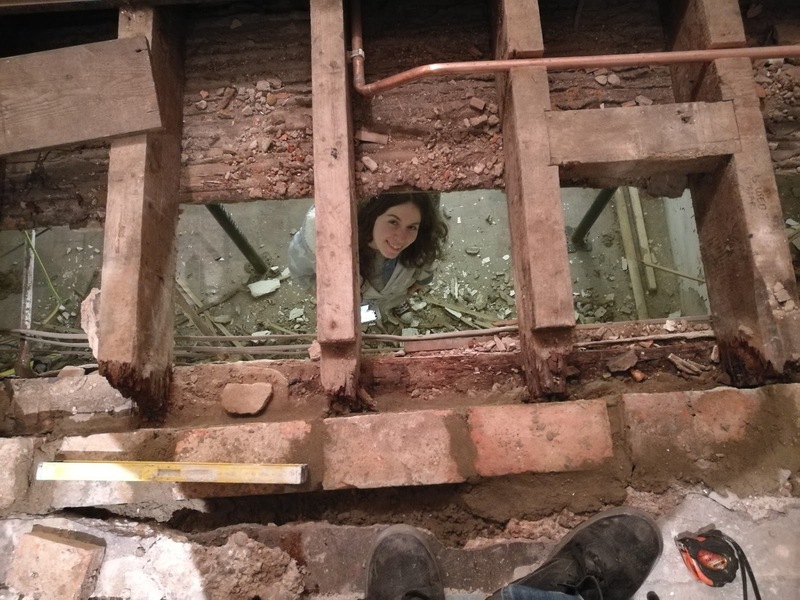 So badly on some of them, that it was a wonder the joists hadn't just fallen down! This method is only suitable if it's just the ends of the joists that are rotten. If the rot had spread further onto the joist then we certainly couldn't have used this method and potentially the whole joist would have had to be replaced, or we'd needed to have bolted a new piece of timber along side it to strengthen it. But luckily for us, it was just the ends that were rotten. So, this is what we did. So the first thing we had to do was support whole floor so that it didn't totally collapse during work. This was probably the scariest part, because we've never used acro-props before and if we were to set it up wrong, it would be game over. Since our dining room is so large, we repaired the joists in two parts, splitting the room in half. So basically, tackling 6 joists at a time. It means we could use two smaller pieces of timber for the wall plate, rather than one giant 5m length that would have been very awkward and difficult to manoeuvre. And it also meant less weight on the acro-props. This wasn't really planned, but it turned out some of the brickwork was absolutely shockingly loose. As in, the bricks were coming away from the wall. We needed strong, properly secured bricks to be able to hang the new wall plate from, so this meant re-bricking a lot of the wall. The worst section was where the old wall had been knocked down between the dining room and kitchen - these bricks underneath that opening. I ended up re-bricking three layers of bricks, two bricks deep. It was a long job that went on until around 2am in the morning. I had re-bricked part of our chimney last year as well as making a DIY fire-pit from bricks and a DIY raised bed, so luckily I've had plenty of practice and Grant got to rest his aching arm muscles. Well, just a little - I still make him mix up mortar for me! The timber we're using for the wall plate is C24 Treated Timber. C24 is a grading for its strength and being treated makes it suitable for use in wet/damp/humid/exterior areas. The timber we selected is as close of a match to the joist sizes that we could find, purchased from a local timber merchants. We had a bit of help from a structural engineer online in clarifying the sizes that would be okay! It's really really important to use graded timber and not just any old cheap stuff - this is a structural job remember. Despite the timber being treated, it doesn't mean it can't rot if it's in direct contact with water, so to make sure it doesn't rot (especially considering it will be held directly against our basement walls) - we've wrapped the back and sides of the timber wall plate in a Damp Proof Membrane (here) secured with Galvanised Clout Nails (found here) along the edges (these won't rust!). I'm afraid this is an after-shot, but hopefully you can see how it's attached. Once that was done, we could then begin planning how we would attach it the wall. We held the timber against the wall where it would be secured (obviously making sure it was level!) and marked out two holes onto the timber between each joist in a kind of jig jag formation. We drilled these holes out through the timber and then marked the same holes out onto the wall before drilling them as well (of course, making sure the brickwork had properly set first!). We used an M10 drill bit (M10 is a weird measurement of "not quite" 10mm) and drilled around 6cm deep into the wall. The way in which we're securing the timber to the wall is with some M10 rods and some super strength chemical resin. It sounds a tad dubious, but resin is seriously strong stuff when used properly and everything I had researched agreed this was the proper method. The rods come in different sizes and these indicate different strength loads they can take - we're using M10 rods with a total of 2 rods between each joist - and this should be more than enough. The rods we bought were 30cm long which was waaaayy to big, but they can be easily cut down with an angle grinder. The one we're using is borrowed but we did buy some new blades to use with it. Here's a snapshot of a video I uploaded to Facebook. I actually do not recommend knees as a suitable vice. AT ALL. We cut our rods down to around 17cm - this allows for 6cm in the wall, a further 4cm going through the timber, and then enough to room to fit bolts over the top. Chemical resin only works properly if the area in which it is used is completely free of dust. Completely. In a long narrow hole this is easier said than done, but we used 3 different methods to make sure we really cleaned it out properly. So the first thing we used was a makeshift vacuum attachment - which was basically a straw attached to the end of the hoover. This was the least successful method but we did it anyway. Secondly, we used an air duster which was hugely successful. You need to make sure you start at the very back of the hole and pull the air duster out slowly as you spray it. Then thirdly, we purchased a hole cleaning brush (purchased from here) which we twizzled around in the hole to make sure any dust that was still yet to fall from the brick was properly cleaned off. After this final step, we went back and did the first and second step again to be 100% on the safe side that there was no dust in the holes. Ideally in a building-from-scratch environment, you would attach the rods to the wall first and then slot the timber wall plate over them and into place. However because we're retro-fitting ours, the joists are already in place sandwiched right up against the wall plate, meaning there isn't the room to slot the timber over the rods. 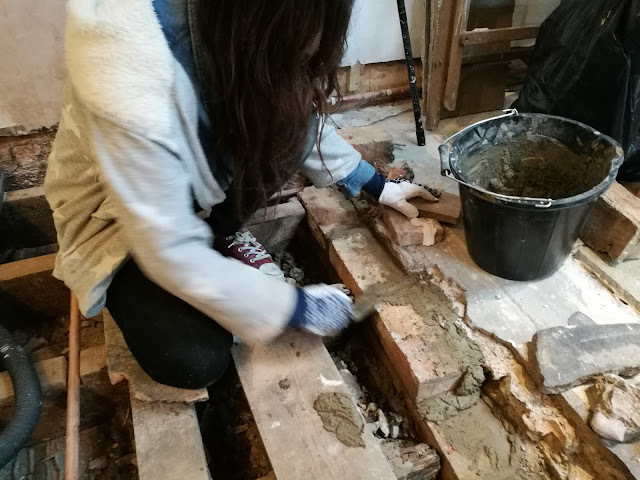 So instead we had to position the wall plate in its place, temporarily drops the rods into the holes without fixings so that it could be hold itself in place and then take one rod out at a time and inject the resin through the timber wall plate. Am I making sense? The resin requires a special gun (found here) and because we're going through the thickness of the wall plate as well, we had to make our own makeshift extra-long nozzle to be able to reach the back of the hole. The nozzles can be bought separately (from here), so we basically secured two together with super glue. It sounds a bit dubious (you don't want the extra nozzle coming off into the hole!!) but it actually worked really well! To inject the resin, it's vital there's no air pockets in the hole, so you really need to push the gun right to the back of the hole, pull the trigger and pull the gun out very very slowly. There's a guide online that tells you how much resin will fill a hole of a certain depth/width (and there's a very handy measure on the side of the bottle!). Once we could see the resin flowing out the hole, we knew we were good to go and the rod can be inserted back into the hole, making sure to give it a bit of a hammer so it goes all the way too the back. We repeated this for each hole. Once the resin had fully dried (and only when it has dried!) we could then affix the bolts. We're using square galvanised washers to give a good tight pull between the wall plate and rods and then attached M10 bolts over the top. The last step was to affix the joist hangers. We did this using galvanised twist nails, which are super super tough and their twisted nature make them almost impossible to get out. The other benefit of using these over screws is that screw-heads can often be sheared off, where-as these can't. We popped a nail into each hole of the hangers - which by the way, were a right old nightmare to find! Nowadays joists are standard size, so the usual supply of hangers are a set size. But because we're affixing these to very old non-standard sizes, it was somewhat difficult to stumble across the right hanger for our thick joists. Thankfully a structural engineer on Instagram pointed us to the right place to find them (THANK YOU!) which were these ones from Metrofixings.co.uk but the hangers with delivery was just a tad pricey! This was something we'd been dreading doing for some time, but surprisingly it really wasn't as difficult as we had imaged. We were however still SO glad to have got it over and done with - especially since it was the last big job before we could finish adding the last tiles ontop of the floor and then onto kitchen fitting! So that's it! I apologise again for the lack of on-the-job photos here. I'd taken so many as well to make sure I could document it really well - but hey ho, life goes on and hopefully you can still make sense of this post! As always here's a breakdown of the costs. It certainly wasn't the cheapest DIY, but it was completely necessary. If was to do this again, I would definitely shop around more for smaller (non-bulk!) bags of fixings, but annoyingly even when just a few quid, these thing just end up adding up real fast!